Since his debut, Bugs has appeared in various short films, feature films, compilations, TV series, music records, comics, video games, award shows, amusement park rides, and commercials. He has also appeared in more films than any other cartoon character, is the ninth most-portrayed film personality in the world, and has his own star on the Hollywood Walk of Fame. According to Chase Craig, who later wrote and drew the first Bugs Bunny comic Sunday pages and the first Bugs comic book, "Bugs was not the creation of any one man; however, he rather represented the creative talents of perhaps five or six directors and many cartoon writers. In those days, the stories were often the work of a group who suggested various gags, bounced them around and finalized them in a joint story conference." A rabbit with some of the personality of Bugs, though looking very different, was originally featured in the film Porky's Hare Hunt, released on April 30, 1938. It was co-directed by Ben "Bugs" Hardaway and an uncredited Cal Dalton (who was responsible for the initial design of the rabbit). This cartoon has an almost identical plot to Avery's Porky's Duck Hunt (1937), which had introduced Daffy Duck. Porky Pig is again cast as a hunter tracking a silly prey who is more interested in driving his pursuer insane and less interested in escaping. Hare Hunt replaces the little black duck with a small white rabbit. The rabbit introduces himself with the odd expression "Jiggers, fellers," and Mel Blanc gave the character a voice and laugh much like those he would later use for Woody Woodpecker. The rabbit character was popular enough with audiences that the Termite Terrace staff decided to use it again. According to Friz Freleng, Hardaway and Dalton had decided to dress the duck in a rabbit suit. The white rabbit had an oval head and a shapeless body. In characterization, he was "a rural buffoon". He was loud, zany with a goofy, guttural laugh. Blanc provided him with a hayseed voice. The rabbit comes back in Prest-O Change-O (1939), directed by Chuck Jones, where he is the pet rabbit of unseen character Sham-Fu the Magician. Two dogs, fleeing the local dogcatcher, enter his absent master's house. The rabbit harasses them but is ultimately bested by the bigger of the two dogs. This version of the rabbit was cool, graceful, and controlled. He retained the guttural laugh but was otherwise silent. The rabbit's third appearance comes in Hare-um Scare-um (1939), directed again by Dalton and Hardaway. This cartoon—the first in which he is depicted as a gray bunny instead of a white one—is also notable as the rabbit's first singing role. Charlie Thorson, lead animator on the film, gave the character a name. He had written "Bugs' Bunny" on the model sheet that he drew for Hardaway. In promotional material for the cartoon, including a surviving 1939 presskit, the name on the model sheet was altered to become the rabbit's own name: "Bugs" Bunny (quotation marks only used, on and off, until 1944). In his autobiography, Blanc claimed that another proposed name for the character was "Happy Rabbit." In the actual cartoons and publicity, however, the name "Happy" only seems to have been used in reference to Bugs Hardaway. In Hare-um Scare-um, a newspaper headline reads, "Happy Hardaway." Animation historian David Gerstein disputes that "Happy Rabbit" was ever used as an official name, believing that the only usage of the term was from Mel Blanc himself in humorous and fanciful tales he told about the character's development in the 1970s and 1980s; the name "Bugs Bunny" was used as early as August 1939, in the Motion Picture Herald, in a review for the short Hare-um Scare-um. Thorson had been approached by Tedd Pierce, head of the story department, and asked to design a better rabbit. The decision was influenced by Thorson's experience in designing hares. He had designed Max Hare in Toby Tortoise Returns (Disney, 1936). For Hardaway, Thorson created the model sheet previously mentioned, with six different rabbit poses. Thorson's model sheet is "a comic rendition of the stereotypical fuzzy bunny". He had a pear-shaped body with a protruding rear end. His face was flat and had large expressive eyes. He had an exaggerated long neck, gloved hands with three fingers, oversized feet, and a "smart aleck" grin. The end result was influenced by Walt Disney Animation Studios' tendency to draw animals in the style of cute infants. He had an obvious Disney influence, but looked like an awkward merger of the lean and streamlined Max Hare from The Tortoise and the Hare (1935), and the round, soft bunnies from Little Hiawatha (1937). In Jones' Elmer's Candid Camera (1940), the rabbit first meets Elmer Fudd. This time the rabbit looks more like the present-day Bugs, taller and with a similar face—but retaining the more primitive voice. Candid Camera's Elmer character design is also different: taller and chubbier in the face than the modern model, though Arthur Q. Bryan's character voice is already established. While Porky's Hare Hunt was the first Warner Bros. cartoon to feature a Bugs Bunny-like rabbit, A Wild Hare, directed by Tex Avery and released on July 27, 1940, is widely considered to be the first official Bugs Bunny cartoon. It is the first film where both Elmer Fudd and Bugs, both redesigned by Bob Givens, are shown in their fully developed forms as hunter and tormentor, respectively; the first in which Mel Blanc uses what would become Bugs' standard voice; and the first in which Bugs uses his catchphrase, "What's up, Doc?" A Wild Hare was a huge success in theaters and received an Academy Award nomination for Best Cartoon Short Subject. For the film, Avery asked Givens to remodel the rabbit. The result had a closer resemblance to Max Hare. He had a more elongated body, stood more erect, and looked more poised. If Thorson's rabbit looked like an infant, Givens' version looked like an adolescent. Blanc gave Bugs the voice of a city slicker. The rabbit was as audacious as he had been in Hare-um Scare-um and as cool and collected as in Prest-O Change-O. Immediately following on A Wild Hare, Bob Clampett's Patient Porky (1940) features a cameo appearance by Bugs, announcing to the audience that 750 rabbits have been born. The gag uses Bugs' Wild Hare visual design, but his goofier pre-Wild Hare voice characterization. The second full-fledged role for the mature Bugs, Chuck Jones' Elmer's Pet Rabbit (1941), is the first to use Bugs' name on-screen: it appears in a title card, "featuring Bugs Bunny," at the start of the film (which was edited in following the success of A Wild Hare). However, Bugs' voice and personality in this cartoon is noticeably different, and his design was slightly altered as well; Bugs' visual design is based on the prototype rabbit in Candid Camera, but with yellow gloves and no buck teeth, has a lower-pitched voice and a more aggressive, arrogant and thuggish personality instead of a fun-loving personality. After Pet Rabbit, however, subsequent Bugs appearances returned to normal: the Wild Hare visual design and personality returned, and Blanc re-used the Wild Hare voice characterization. Hiawatha's Rabbit Hunt (1941), directed by Friz Freleng, became the second Bugs Bunny cartoon to receive an Academy Award nomination. The fact that it didn't win the award was later spoofed somewhat in What's Cookin' Doc? (1944), in which Bugs demands a recount (claiming to be a victim of "sa-bo-TAH-gee") after losing the Oscar to James Cagney and presents a clip from Hiawatha's Rabbit Hunt to prove his point. By 1942, Bugs had become the number one star of Merrie Melodies. The series was originally intended only for one-shot characters in films after several early attempts to introduce characters (Foxy, Goopy Geer, and Piggy) failed under Harman–Ising. By the mid-1930s, under Leon Schlesinger, Merrie Melodies started introducing newer characters. Bugs Bunny Gets the Boid (1942) shows a slight redesign of Bugs, with less-prominent front teeth and a rounder head. The character was reworked by Robert McKimson, then an animator in Clampett's unit. The redesign at first was only used in the films created by Clampett's unit, but in time it would be taken up by the other directors, with Freleng and Frank Tashlin the first. When McKimson was himself promoted to director, he created yet another version, with more slanted eyes, longer teeth and a much larger mouth. He used this version until 1949 (as did Art Davis for the one Bugs Bunny film he directed, Bowery Bugs) when he started using the version he had designed for Clampett. Jones would come up with his own slight modification, and the voice had slight variations between the units. Bugs also made cameos in Avery's final Warner Bros. cartoon, Crazy Cruise. Since Bugs' debut in A Wild Hare, he appeared only in color Merrie Melodies films (making him one of the few recurring characters created for that series in the Schlesinger era prior to the full conversion to color), alongside Elmer predecessor Egghead, Inki, Sniffles, and Elmer himself. While Bugs made a cameo in Porky Pig's Feat (1943), this was his only appearance in a black-and-white Looney Tunes film. He did not star in a Looney Tunes film until that series made its complete conversion to only color cartoons beginning in 1944. Buckaroo Bugs was Bugs' first film in the Looney Tunes series and was also the last Warner Bros. cartoon to credit Schlesinger (as he had retired and sold his studio to Warner Bros. that year). Bugs' popularity soared during World War II because of his free and easy attitude, and he began receiving special star billing in his cartoons by 1943. By that time, Warner Bros. had become the most profitable cartoon studio in the United States. In company with cartoon studios such as Disney and Famous Studios, Warners pitted its characters against Adolf Hitler, Benito Mussolini, Francisco Franco, and the Japanese. Bugs Bunny Nips the Nips (1944) features Bugs at odds with a group of Japanese soldiers. This cartoon has since been pulled from distribution due to its depiction of Japanese people. One US Navy propaganda film saved from destruction features the voice of Mel Blanc in "Tokyo Woes" (1945) about the propaganda radio host Tokyo Rose. He also faces off against Hermann Göring and Hitler in Herr Meets Hare (1945), which introduced his well-known reference to Albuquerque as he mistakenly winds up in the Black Forest of 'Joimany' instead of Las Vegas, Nevada. Bugs also appeared in the 1942 two-minute U.S. war bonds commercial film Any Bonds Today?, along with Porky and Elmer. At the end of Super-Rabbit (1943), Bugs appears wearing a United States Marine Corps dress blue uniform. As a result, the Marine Corps made Bugs an honorary Marine master sergeant. From 1943 to 1946, Bugs was the official mascot of Kingman Army Airfield, Kingman, Arizona, where thousands of aerial gunners were trained during World War II. Some notable trainees included Clark Gable and Charles Bronson. Bugs also served as the mascot for 530 Squadron of the 380th Bombardment Group, 5th Air Force, U.S. Air Force, which was attached to the Royal Australian Air Force and operated out of Australia's Northern Territory from 1943 to 1945, flying B-24 Liberator bombers. Bugs riding an air delivered torpedo served as the squadron logo for Marine Torpedo/Bomber Squadron 242 in the Second World War. Additionally, Bugs appeared on the nose of B-24J #42-110157, in both the 855th Bomb Squadron of the 491st Bombardment Group (Heavy) and later in the 786th BS of the 466th BG(H), both being part of the 8th Air Force operating out of England. Bugs (standing in for Porky Pig) in the closing to Hare Tonic (1945) and Baseball Bugs (1946). In 1944, Bugs Bunny made a cameo appearance in Jasper Goes Hunting, a Puppetoons film produced by rival studio Paramount Pictures. In this cameo (animated by McKimson, with Blanc providing the usual voice), Bugs (after being threatened at gunpoint) pops out of a rabbit hole, saying his usual catchphrase; after hearing the orchestra play the wrong theme song, he realizes "Hey, I'm in the wrong picture!" and then goes back in the hole. Bugs also made a cameo in the Private Snafu short Gas, in which he is found stowed away in the titular private's belongings; his only spoken line is his usual catchphrase. Although it was usually Porky Pig who brought the Looney Tunes films to a close with his stuttering, "That's all, folks! ", Bugs replaced him at the end of Hare Tonic and Baseball Bugs, bursting through a drum just as Porky did, but munching on a carrot and saying in his Bronx/Brooklyn accent, "And that's the end!" After World War II, Bugs continued to appear in numerous Warner Bros. cartoons, making his last "Golden Age" appearance in False Hare (1964). He starred in over 167 theatrical short films, most of which were directed by Friz Freleng, Robert McKimson, and Chuck Jones. Freleng's Knighty Knight Bugs (1958), in which a medieval Bugs trades blows with Yosemite Sam and his fire-breathing dragon (which has a cold), won an Academy Award for Best Cartoon Short Subject (becoming the first Bugs Bunny cartoon to win said award). Three of Jones' films — Rabbit Fire, Rabbit Seasoning and Duck! Rabbit, Duck! — compose what is often referred to as the "Rabbit Season/Duck Season" trilogy and were the origins of the rivalry between Bugs and Daffy Duck. Jones' classic What's Opera, Doc? (1957), casts Bugs and Elmer Fudd in a parody of Richard Wagner's Der Ring des Nibelungen. It was deemed "culturally significant" by the United States Library of Congress and selected for preservation in the National Film Registry in 1992, becoming the first cartoon short to receive this honor. In the fall of 1960, ABC debuted the prime-time television program The Bugs Bunny Show. This show packaged many of the post-1948 Warners cartoons with newly animated wraparounds. After two seasons, it was moved from its evening slot to reruns on Saturday mornings. The Bugs Bunny Show changed format and exact title frequently but remained on network television for 40 years. The packaging was later completely different, with each cartoon simply presented on its own, title and all, though some clips from the new bridging material were sometimes used as filler. 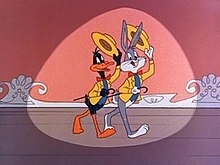 Bugs and Daffy in the intro to The Bugs Bunny Show (1960–2000). Bugs did not appear in any of the post-1964 Looney Tunes and Merrie Melodies films produced by DePatie-Freleng Enterprises or Seven Arts Productions, nor did he appear in the lone Looney Tunes TV special produced by Filmation. He would not appear in new material on-screen again until Bugs and Daffy's Carnival of the Animals aired in 1976. From the late 1970s through the early 1990s, Bugs was featured in various animated specials for network television, such as Bugs Bunny's Thanksgiving Diet, Bugs Bunny's Easter Special, Bugs Bunny's Looney Christmas Tales, and Bugs Bunny's Bustin' Out All Over. Bugs also starred in several theatrical compilation features during this time, including the United Artists distributed documentary Bugs Bunny: Superstar (1975) and Warner Bros.' own releases: The Bugs Bunny/Road Runner Movie (1979), The Looney Looney Looney Bugs Bunny Movie (1981), Bugs Bunny's 3rd Movie: 1001 Rabbit Tales (1982), and Daffy Duck's Quackbusters (1988). In the 1988 live-action/animated comedy, Who Framed Roger Rabbit, Bugs appeared as one of the inhabitants of Toontown. However, since the film was being produced by Disney, Warner Bros. would only allow the use of their biggest star if he got an equal amount of screen time as Disney's biggest star, Mickey Mouse. Because of this, both characters are always together in frame when onscreen. Roger Rabbit was also one of the final productions in which Mel Blanc voiced Bugs (as well as the other Looney Tunes characters) before his death in 1989. Bugs later appeared in another animated production featuring numerous characters from rival studios: the 1990 drug prevention TV special Cartoon All-Stars to the Rescue. This special is notable for being the first time that someone other than Blanc voiced Bugs and Daffy (both characters were voiced by Jeff Bergman for this). Bugs also made guest appearances in the early 1990s television series Tiny Toon Adventures, as the principal of Acme Looniversity and the mentor of Babs and Buster Bunny. He made further cameos in Warner Bros.' subsequent animated TV shows Taz-Mania, Animaniacs, and Histeria! Bugs returned to the silver screen in Box-Office Bunny (1991). This was the first Bugs Bunny cartoon since 1964 to be released in theaters and it was created for Bugs' 50th anniversary celebration. It was followed by (Blooper) Bunny, a cartoon that was shelved from theaters, but later premiered on Cartoon Network in 1997 and has since gained a cult following among animation fans for its edgy humor. In 1996, Bugs and the other Looney Tunes characters appeared in the live-action/animated film, Space Jam, directed by Joe Pytka and starring NBA superstar Michael Jordan. The film also introduced the character Lola Bunny, who becomes Bugs' new love interest. Space Jam received mixed reviews from critics, but was a box office success (grossing over $230 million worldwide). The success of Space Jam led to the development of another live-action/animated film, Looney Tunes: Back in Action, released in 2003 and directed by Joe Dante. Unlike Space Jam, Back in Action was a box-office bomb, though it did receive more positive reviews from critics. In 1997, Bugs appeared on a U.S. postage stamp, the first cartoon to be so honored, beating the iconic Mickey Mouse. The stamp is number seven on the list of the ten most popular U.S. stamps, as calculated by the number of stamps purchased but not used. The introduction of Bugs onto a stamp was controversial at the time, as it was seen as a step toward the 'commercialization' of stamp art. The postal service rejected many designs and went with a postal-themed drawing. Avery Dennison printed the Bugs Bunny stamp sheet, which featured "a special ten-stamp design and was the first self-adhesive souvenir sheet issued by the U.S. Postal Service." A younger version of Bugs is the main character of Baby Looney Tunes, which debuted on Kids' WB in 2001. In the action comedy Loonatics Unleashed, his definite descendant Ace Bunny is the leader of the Loonatics team and seems to have inherited his ancestor's Brooklyn accent and comic wit. Bugs as he appears in The Looney Tunes Show Season 2. In 2011, Bugs Bunny and the rest of the Looney Tunes gang returned to television in the Cartoon Network sitcom, The Looney Tunes Show. The characters feature new designs by artist Jessica Borutski. Among the changes to Bugs' appearance were the simplification and enlargement of his feet, as well as a change to his fur from gray to a shade of mauve (though in the second season, his fur was changed back to gray). In the series, Bugs and Daffy Duck are portrayed as best friends as opposed to their usual pairing as rivals. At the same time, Bugs is more openly annoyed at Daffy's antics in the series (sometimes to the point of aggression), compared to his usual carefree personality from the original cartoons. Bugs and Daffy are close friends with Porky Pig in the series, although Bugs tends to be a more reliable friend to Porky than Daffy is. Bugs also dates Lola Bunny in the show despite the fact that he finds her to be "crazy" and a bit too talkative at first (he later learns to accept her personality quirks, similar to his tolerance for Daffy). Unlike the original cartoons, Bugs lives in a regular home which he shares with Daffy, Taz (whom he treats as a pet dog) and Speedy Gonzales, in the middle of a cul-de-sac with their neighbors Yosemite Sam, Granny, and Witch Hazel. In 2015, Bugs starred in the direct-to-video film Looney Tunes: Rabbits Run, and later returned to television yet again as the star of Cartoon Network and Boomerang's comedy series New Looney Tunes (formerly Wabbit). Bugs has also appeared in numerous video games, including the Bugs Bunny's Crazy Castle series, Bugs Bunny Birthday Blowout, Bugs Bunny: Rabbit Rampage, Bugs Bunny in Double Trouble, Looney Tunes B-Ball, Looney Tunes Racing, Looney Tunes: Space Race, Bugs Bunny Lost in Time, Bugs Bunny and Taz Time Busters, Loons: The Fight for Fame, Looney Tunes: Acme Arsenal, Scooby Doo and Looney Tunes: Cartoon Universe, Looney Tunes Dash, and Looney Tunes World of Mayhem. "Some people call me cocky and brash, but actually I am just self-assured. I'm nonchalant, im­perturbable, contemplative. I play it cool, but I can get hot under the collar. And above all I'm a very 'aware' character. I'm well aware that I am appearing in an animated car­toon....And sometimes I chomp on my carrot for the same reason that a stand-up comic chomps on his cigar. It saves me from rushing from the last joke to the next one too fast. And I sometimes don't act, I react. And I always treat the contest with my pursuers as 'fun and games.' When momentarily I appear to be cornered or in dire danger and I scream, don't be consoined – it's actually a big put-on. Let's face it, Doc. I've read the script and I al­ready know how it turns out." —Bob Clampett on Bugs Bunny, written in first person. Bugs Bunny is characterized as being clever and capable of outsmarting almost anyone who antagonizes him, including Elmer Fudd, Yosemite Sam, Tasmanian Devil, Marvin the Martian, Wile E. Coyote, Gossamer, Witch Hazel, Rocky and Mugsy, The Crusher, Beaky Buzzard, Willoughby the Dog, Count Blood Count, Daffy Duck and a host of others. The only one to consistently beat Bugs is Cecil Turtle, who defeats Bugs in three consecutive shorts based on the premise of the Aesop fable The Tortoise and the Hare. In a rare villain turn, Bugs turns to a life of crime in 1949's Rebel Rabbit, taking on the entire United States government by vandalizing monuments in an effort to prove he is worth more than the two-cent bounty on his head; while he succeeds in raising the bounty to $1,000,000, the full force of the military ends up capturing Bugs and sending him to Alcatraz. Bugs almost always wins these conflicts, a plot pattern which recurs in Looney Tunes films directed by Chuck Jones. Concerned that viewers would lose sympathy for an aggressive protagonist who always won, Jones arranged for Bugs to be bullied, cheated, or threatened by the antagonists while minding his own business, justifying his subsequent antics as retaliation or self-defense. He's also been known to break the fourth wall by "communicating" with the audience, either by explaining the situation (e.g. "Be with you in a minute, folks! "), describing someone to the audience (e.g. "Feisty, ain't they? "), clueing in on the story (e.g. "That happens to him all during the picture, folks. "), explaining that one of his antagonists' actions have pushed him to the breaking point ("Of course you realize, this means war. "), admitting his own deviousness toward his antagonists ("Ain't I a stinker? "), etc. Bugs will usually try to placate the antagonist and avoid conflict, but when an antagonist pushes him too far, Bugs may address the audience and invoke his catchphrase "Of course you realize this means war!" before he retaliates, and the retaliation will be devastating. This line was taken from Groucho Marx and others in the 1933 film Duck Soup (1933) and was used again in the next Marx Brothers film A Night at the Opera (1935). Bugs would pay homage to Groucho in other ways, such as occasionally adopting his stooped walk or leering eyebrow-raising (in Hair-Raising Hare, for example) or sometimes with a direct impersonation (as in Slick Hare). Other directors, such as Friz Freleng, characterized Bugs as altruistic. When Bugs meets other successful characters (such as Cecil Turtle in Tortoise Beats Hare, or the Gremlin in Falling Hare), his overconfidence becomes a disadvantage. Bugs' nonchalant carrot-chewing standing position, as explained by Freleng, Jones and Bob Clampett, originated in a scene from the film It Happened One Night (1934), in which Clark Gable's character Peter Warne leans against a fence, eating carrots rapidly and talking with his mouth full to Claudette Colbert's character. This scene was well known while the film was popular, and viewers at the time likely recognized Bugs Bunny's behavior as satire. Coincidentally, the film also features a minor character, Oscar Shapely, who addresses Peter Warne as "Doc", and Warne mentions an imaginary person named "Bugs Dooley" to frighten Shapely. "'What's up Doc?' is a very simple thing. It's only funny because it's in a situation. It was an all Bugs Bunny line. It wasn't funny. If you put it in human terms; you come home late one night from work, you walk up to the gate in the yard, you walk through the gate and up into the front room, the door is partly open and there's some guy shooting under your living room. So what do you do? You run if you have any sense, the least you can do is call the cops. But what if you come up and tap him on the shoulder and look over and say 'What's up Doc?' You're interested in what he's doing. That's ridiculous. That's not what you say at a time like that. So that's why it's funny, I think. In other words it's asking a perfectly legitimate question in a perfectly illogical situation." —Chuck Jones on Bugs Bunny's catchphrase "What's up Doc?" 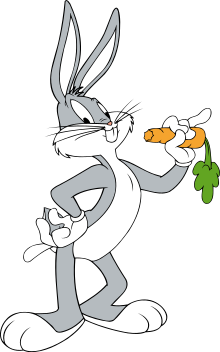 The carrot-chewing scenes are generally followed by Bugs' most well-known catchphrase, "What's up, Doc? ", which was written by director Tex Avery for his first Bugs Bunny film, A Wild Hare (1940). Avery explained later that it was a common expression in his native Texas and that he did not think much of the phrase. When the cartoon was first screened in theaters, the "What's up, Doc?" scene generated a tremendously positive audience reaction. As a result, the scene became a recurring element in subsequent cartoons. The phrase was sometimes modified for a situation. For example, Bugs says "What's up, dogs?" to the antagonists in A Hare Grows in Manhattan, "What's up, Duke?" to the knight in Knight-mare Hare, and "What's up, prune-face?" to the aged Elmer in The Old Grey Hare. He might also greet Daffy with "What's up, Duck?" He used one variation, "What's all the hub-bub, bub?" only once, in Falling Hare. Another variation is used in Looney Tunes: Back in Action when he greets a blaster-wielding Marvin the Martian saying "What's up, Darth?" Several Chuck Jones films in the late 1940s and 1950s depict Bugs travelling via cross-country (and, in some cases, intercontinental) tunnel-digging, ending up in places as varied as Barcelona, Spain (Bully for Bugs), the Himalayas (The Abominable Snow Rabbit), and Antarctica (Frigid Hare) all because he "knew (he) shoulda taken that left toin at Albukoikee." He first utters that phrase in Herr Meets Hare (1945), when he emerges in the Black Forest, a cartoon seldom seen today due to its blatantly topical subject matter. When Hermann Göring says to Bugs, "There is no Las Vegas in 'Chermany'" and takes a potshot at Bugs, Bugs dives into his hole and says, "Joimany! Yipe! ", as Bugs realizes he is behind enemy lines. The confused response to his "left toin" comment also followed a pattern. For example, when he tunnels into Scotland in My Bunny Lies over the Sea (1948), while thinking he is heading for the La Brea Tar Pits in Los Angeles, California, it provides another chance for an ethnic joke: "Therrre arrre no La Brrrea Tarrr Pits in Scotland!" (to which Bugs responds, "Scotland!? Eh...what's up, Mac-doc?"). A couple of late-1950s/early-1960s cartoons of this ilk also featured Daffy Duck travelling with Bugs ("Hey, wait a minute! Since when is Pismo Beach inside a cave?"). Mel Blanc was the original voice of Bugs and would voice the character for nearly five decades. Mel Blanc voiced the character for almost 50 years, from Bugs' debut in the 1940 short A Wild Hare until Blanc's death in 1989. Blanc described the voice as a combination of Bronx and Brooklyn accents; however, Tex Avery claimed that he asked Blanc to give the character not a New York accent per se, but a voice like that of actor Frank McHugh, who frequently appeared in supporting roles in the 1930s and whose voice might be described as New York Irish. In Bugs' second cartoon Elmer's Pet Rabbit, Blanc created a completely new voice for Bugs, which sounded like a Jimmy Stewart impression, but the directors decided the previous voice was better. Though Blanc's best known character was the carrot-chomping rabbit, munching on the carrots interrupted the dialogue. Various substitutes, such as celery, were tried, but none of them sounded like a carrot. So for the sake of expedience, he would munch and then spit the carrot bits into a spittoon rather than swallowing them, and continue with the dialogue. One often-repeated story, which dates back to the 1940s, is that Blanc was allergic to carrots and had to spit them out to minimize any allergic reaction — but his autobiography makes no such claim. In fact, in a 1984 interview with Tim Lawson, co-author of The Magic Behind The Voices: A Who's Who of Voice Actors, Blanc emphatically denied being allergic to carrots. Bugs Bunny was continuously featured in comic books for more than 40 years, from 1941 to 1983, and has appeared sporadically since then. Bugs first appeared in comic books in 1941, in Looney Tunes and Merrie Melodies Comics #1, published by Dell Comics. Bugs was a recurring star in that book all through its run, which was 153 issues until July 1954. Western Publishing (and its Dell imprint) published 245 issues of a Bugs Bunny comic book from Dec. 1952/Jan. 1953 to 1983. The company also published 81 issues of the joint title Yosemite Sam and Bugs Bunny from December 1970 to 1983. During the 1950s Dell also published a number of Bugs Bunny spinoff titles. Creators on those series included Chase Craig, Helen Houghton, Eleanor Packer, Lloyd Turner, Michael Maltese, John Liggera, Tony Strobl, Veve Risto, Cecil Beard, Pete Alvorado, Carl Fallberg, Cal Howard, Vic Lockman, Lynn Karp, Pete Llanuza, Pete Hansen, Jack Carey, Del Connell, Kellog Adams, Jack Manning, Mark Evanier, Tom McKimson, Joe Messerli, Carlos Garzon, Donald F. Glut, Sealtiel Alatriste, Sandro Costa, and Massimo Fechi. The German publisher Condor published a 76-issues Bugs Bunny series (translated and reprinted from the American comics) in the mid-1970s. Egmont Ehapa published a weekly reprint series in the mid-1990s. The Bugs Bunny comic strip ran for more than 50 years, from 1942 to 1993, syndicated by the Newspaper Enterprise Association. It started out as a Sunday page and in 1948 became a daily strip. The strip originated with Chase Craig, who did the first five weeks before leaving for military service in World War II. Roger Armstrong illustrated the strip from 1942 to 1944. The creators most associated with the strip are writers Albert Stoffel (1947–1979) & Carl Fallberg (1950–1969), and artist Ralph Heimdahl, who worked on it from 1947 to 1979. Other creators associated with the Bugs Bunny strip include Jack Hamm, Carl Buettner, Phil Evans, Carl Barks (1952), Tom McKimson, Arnold Drake, Frank Hill, Brett Koth, and Shawn Keller. Bugs' star on the Hollywood Walk of Fame. Statue evoking Bugs Bunny at Butterfly Park Bangladesh. Like Mickey Mouse for Disney, Bugs Bunny has served as the mascot for Warner Bros. and its various divisions. According to Guinness World Records, Bugs has appeared in more films (both short and feature-length) than any other cartoon character, and is the ninth most-portrayed film personality in the world. On December 10, 1985, Bugs became the second cartoon character (after Mickey) to receive a star on the Hollywood Walk of Fame. He also has been a pitchman for companies including Kool-Aid and Nike. His Nike commercials with Michael Jordan as "Hare Jordan" for the Air Jordan VII and VIII became precursors to Space Jam. As a result, he has spent time as an honorary member of Jordan Brand, including having Jordan's Jumpman logo done in his image. In 2015, as part of the 30th anniversary of Jordan Brand, Nike released a mid-top Bugs Bunny version of the Air Jordan I, named the "Air Jordan Mid 1 Hare", along with a women's equivalent inspired by Lola Bunny called the "Air Jordan Mid 1 Lola", along with a commercial featuring Bugs and Ahmad Rashad. In 2002, TV Guide compiled a list of the 50 greatest cartoon characters of all time as part of the magazine's 50th anniversary. Bugs Bunny was given the honor of number 1. In a CNN broadcast on July 31, 2002, a TV Guide editor talked about the group that created the list. The editor also explained why Bugs pulled top billing: "His stock...has never gone down...Bugs is the best example...of the smart-aleck American comic. He not only is a great cartoon character, he's a great comedian. He was written well. He was drawn beautifully. He has thrilled and made many generations laugh. He is tops." Some have noted that comedian Eric Andre is the nearest contemporary comedic equivalent to Bugs. They attribute this to, "their ability to constantly flip the script on their unwitting counterparts." American use of the term Nimrod to mean "idiot" is attributed (in Garner's Modern American Usage) entirely to Bugs's expostulation "What a Nimrod!" to describe the inept hunter Elmer Fudd. ^ a b c d Adamson, Joe (1990). Bugs Bunny: 50 Years and Only One Grey Hare. Henry Holt. ISBN 0-8050-1855-7. ^ a b "Is Bugs Bunny a Rabbit or a Hare?". Retrieved October 20, 2018. ^ a b "What's the Difference Between Rabbits and Hares?". Retrieved October 20, 2018. ^ "Mel Blanc". Behind the Voice Actors. Retrieved 2013-02-05. ^ "Bugs Bunny: The Trickster, American Style". Weekend Edition Sunday. NPR. January 6, 2008. Retrieved 2011-04-10. ^ a b c "Most Portrayed Character in Film". Guinness World Records. May 2011. Archived from the original on February 4, 2012. ^ a b "Bugs Bunny". Hollywood Chamber of Commerce. Retrieved 28 June 2012. ^ a b "'Bugs Bunny'&#39". Encyclopædia Britannica. Britannica.com. Retrieved 2009-09-20. ^ a b c Barrier, Michael (2003-11-06). Hollywood Cartoons: American Animation in Its Golden Age. United States: Oxford University Press. p. 672. ISBN 978-0-19-516729-0. ^ "Leading the Animation Conversation » Rare 1939 Looney Tunes Book found!". Cartoon Brew. 2008-04-03. Archived from the original on 2008-12-16. Retrieved 2009-09-20. ^ a b Blanc, Mel; Bashe, Philip (1989). That's Not All, Folks!. Clayton South, VIC, Australia: Warner Books. ISBN 0-446-51244-3. ^ "Looney Tunes Hidden Gags". Gregbrian.tripod.com. Retrieved 2009-09-20. ^ Motion Picture Herald: August 12, 1939[permanent dead link] "...With gun and determination, he takes to the field and tracks his prey in the zany person of "Bugs" Bunny, a true lineal descendant of the original Mad Hatter if there ever was one..."
^ a b Adamson, Joe (1975). Tex Avery: King of Cartoons. New York City: Da Capo Press. ISBN 0-306-80248-1. ^ "1940 academy awards". Retrieved 2007-09-20. ^ "1941 academy awards". Retrieved 2013-02-10. ^ a b "Globat Login". Archived from the original on 2013-02-11. Retrieved 2013-01-14. ^ Lehman, Christopher P. (2008). The Colored Cartoon: Black Representation in American Animated Short Films, 1907–1954. Amherst, Massachusetts: University of Massachusetts Press. p. 73. ISBN 978-1-55849-613-2. Retrieved 2009-02-25. ^ "Warner Bros. Studio biography". AnimationUSA.com. Retrieved July 22, 2008. ^ Audio commentary by Paul Dini for Super-Rabbit on the Looney Tunes Golden Collection: Volume 3 (2005). ^ "History of the 380th Bomb Group". 380th.org. Retrieved 2010-01-07. ^ "Jasper Goes Hunting information". Bcdb.com. Retrieved September 20, 2009. ^ "1958 academy awards". Retrieved 2007-09-20. ^ "Complete National Film Registry Listing - National Film Preservation Board". ^ " "Archived copy". Archived from the original on 2010-12-02. Retrieved 2010-11-12. CS1 maint: Archived copy as title (link)". Looney Tunes on Television. Retrieved November 7, 2010. ^ "Cartoon special: Congressmen treated to preview of program to air on network, independent and cable outlets". The Los Angeles Times. 1990-04-19. Retrieved 2010-08-24. ^ Bernstein, Sharon (1990-04-20). "Children's TV: On Saturday, networks will simulcast 'Cartoon All-Stars to the Rescue,' an animated feature on drug abuse". The Los Angeles Times. Retrieved 2010-08-24. ^ "Hollywood and Networks Fight Drugs With Cartoon". New York Times. 1990-04-21. Retrieved 2010-08-29. ^ "Karmatoons - What I have Done". ^ Knight, Richard. "Consider the Source". Chicagoreader.com. Retrieved 2009-09-20. ^ Ford, Greg. Audio commentary for (Blooper) Bunny on Disc One of the Looney Tunes Golden Collection: Volume 1. ^ "Space Jam". Rotten Tomatoes. Flixster. Retrieved 2011-12-02. ^ McCarthy, Todd (1996-11-17). "Space Jam". Variety. Reed Business Information. Retrieved 2011-12-02. ^ "Space Jam (1996)". Box Office Mojo. Internet Movie Database. Retrieved 2011-12-02. ^ "Looney Tunes: Back in Action". Rotten Tomatoes. Retrieved 2008-01-29. ^ "Looney Tunes: Back in Action Reviews, Ratings, Credits, and More". Metacritic. Retrieved 2008-01-29. ^ "Looney Tunes: Back in Action :: rogerebert.com :: Reviews". Rogerebert.suntimes.com. 2003-11-14. Retrieved October 29, 2012. ^ Looney Tunes: Bugs Bunny stamp. National Postal Museum Smithsonian. ^ George Gene Gustines (2005-06-06). "It's 2772. Who Loves Ya, Tech E. Coyote?". The New York Times. Retrieved 2010-10-30. ^ King, Darryn (May 5, 2015). "Bugs Bunny to Return in Direct-to-Video 'Rabbits Run'". Cartoon Brew. Retrieved May 5, 2015. ^ Steinberg, Brian (March 10, 2014). "Cartoon Network To Launch First Mini-Series, New Takes on Tom & Jerry, Bugs Bunny". Variety.com. Variety Media, LLC. Retrieved March 13, 2014. ^ Steinberg, Brian (29 June 2015). "Bugs Bunny, Scooby-Doo Return in New Shows to Boost Boomerang". ^ "Chapter 11: What's Up Doc?". Draw the Looney Tunes: The Warner Bros. Character Design Manual. San Francisco: Chronicle Books. 2005. p. 166. ISBN 0-8118-5016-1. ^ "Transcript of Duck Soup". Script-o-rama.com. Retrieved 2009-09-20. ^ "It Happened One Night film review by Tim Dirks". Filmsite.org. Retrieved 2009-09-20. ^ Sito, Tom (17 June 1998). "'Chuck Jones Interview'". Archive of American Television. Retrieved 4 October 2013. ^ "Warner Club News (1944)". Retrieved July 30, 2018. ^ a b c d e f g h i "Voice(s) of Bugs Bunny". ^ "Keith Scott-"The One-Man Crowd"". Retrieved January 8, 2019. ^ Houhgton entry, Who's Who of American Comics Books, 1928–1999. Accessed Nov. 28, 2018. ^ Packer entry, Who's Who of American Comics Books, 1928–1999. Accessed Nov. 28, 2018. ^ Turner entry, Who's Who of American Comics Books, 1928–1999. Accessed Nov. 28, 2018. ^ Liggera entry, Who's Who of American Comics Books, 1928–1999. Accessed Nov. 28, 2018. ^ Craig entry, Lambiek's Comiclopedia. Accessed Nov. 28, 2018. ^ Armstrong entry, Who's Who of American Comics Books, 1928–1999. Accessed Nov. 28, 2018. ^ Ron Goulart, Encyclopedia of American Comics. New York, Facts on File, 1992. ISBN 9780816025824 pp. 33-4,37,57,73-74,106,262-263. ^ "Bugs Bunny tops greatest cartoon characters list". CNN.com. 2002-07-30. Archived from the original on February 8, 2008. Retrieved 2008-02-27. ^ "List of All-time Cartoon Characters". CNN.com. CNN. July 30, 2002. Archived from the original on June 3, 2009. Retrieved April 11, 2007. ^ "CNN LIVE TODAY: 'TV Guide' Tipping Hat to Cartoon Characters". CNN.com. CNN. July 31, 2002. Retrieved April 11, 2007. ^ Neilan, Dan. "Eric Andre's nearest comedic equivalent may be Bugs Bunny". The A.V. Club. Retrieved 2017-11-10. ^ Garner, Bryan A. (3rd Edition, 2009). Garner's Modern American Usage, p. liii. Oxford University Press. ISBN 0-19-538275-7. Adamson, Joe (1990). Bugs Bunny: 50 Years and Only One Grey Hare. New York: Henry Holt. ISBN 0-8050-1855-7. Beck, Jerry; Friedwald, Will (1989). Looney Tunes and Merrie Melodies. New York: Henry Holt. ISBN 0-8050-0894-2. Jones, Chuck (1989). Chuck Amuck: The Life and Times of an Animated Cartoonist. New York: Farrar, Straus and Giroux. ISBN 0-374-12348-9. Blanc, Mel; Bashe, Philip (1988). That's Not All, Folks!. Clayton South, VIC, Australia: Warner Books. ISBN 0-446-39089-5. Maltin, Leonard (1987). Of Mice and Magic: A History of American Animated Cartoons (Revised ed.). New York: Plume Book. ISBN 0-452-25993-2. Barrier, Michael (2003). "Warner Bros., 1933-1940". Hollywood Cartoons : American Animation in Its Golden Age: American Animation in Its Golden Age. Oxford University Press. ISBN 9780198020790. Rubin, Rachel (2000). "A Gang of Little Yids". Jewish Gangsters of Modern Literature. University of Illinois Press. ISBN 9780252025396. Wikimedia Commons has media related to Bugs Bunny.